When it comes to clothes shopping for little girls, there are a lot of options out there. But if you're like me, you don't want to spend the same amount on your kids' clothes as you do on your own. After all, they're just going to outgrow them in a few months and/or ruin them eating spaghetti. Thankfully there are a lot of brands out there that are super cute and durable but not high on cost. 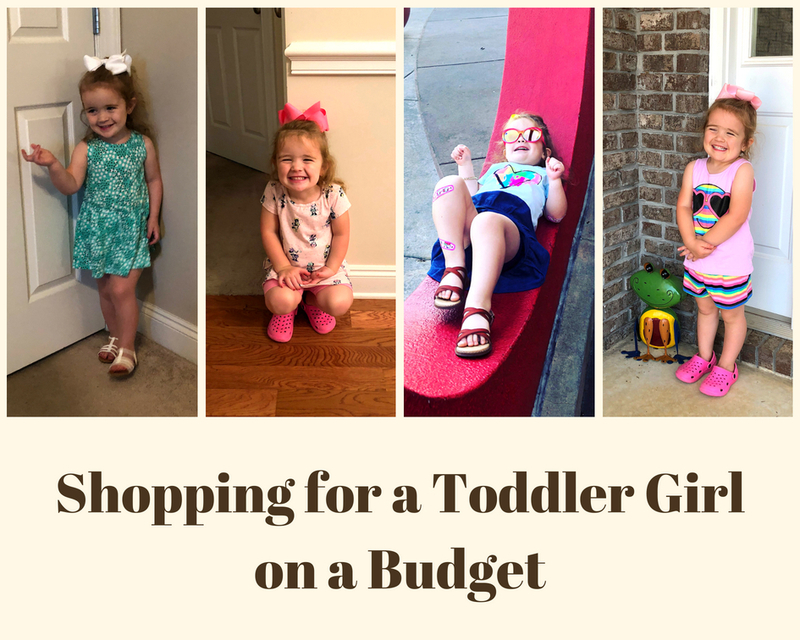 I'm sharing some of our favorite money-saving brands in this post. 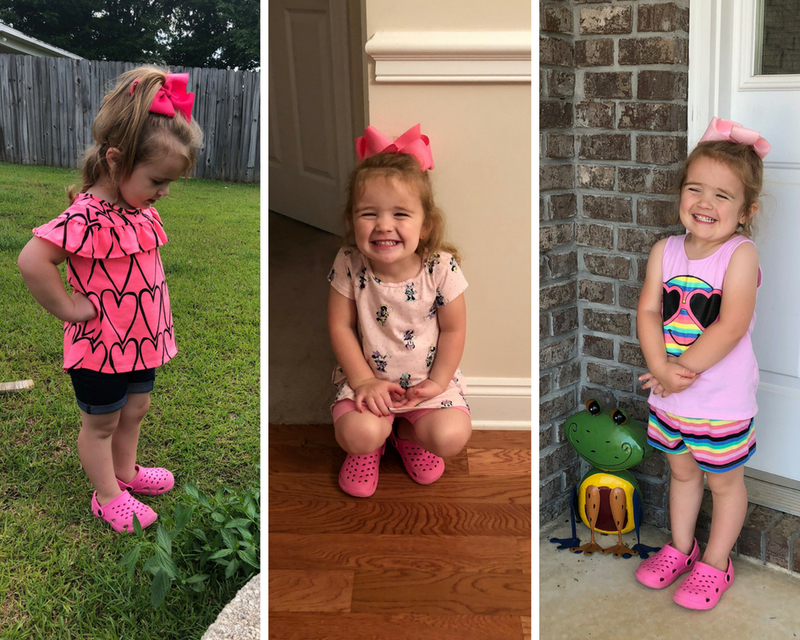 When it comes to cheap, cute, durable clothes for little ones, Garanimals may have the market cornered. That's probably why a majority of the clothing in Alexis's closet and drawers is this brand. This year's printed cuffed jegging shorts and matching tie-front raglan tees are my favorite for casual weekends. We also stock up on the graphic tees and raglan tees for daycare (I recommend buying Garanimals shirts one size up. They shrink.). And because little girls are often not ladylike when wearing cute dresses, these bike shorts come in handy. Here's the link to the pink skort she's wearing in the second picture above. This is one of my absolute favorite brands. Cost wise, it's a little bit higher than Garanimals, but they have a much larger selection. Also, they don't shrink! I still buy Alexis's t-shirts one size up just to get a little bit longer use out of them. 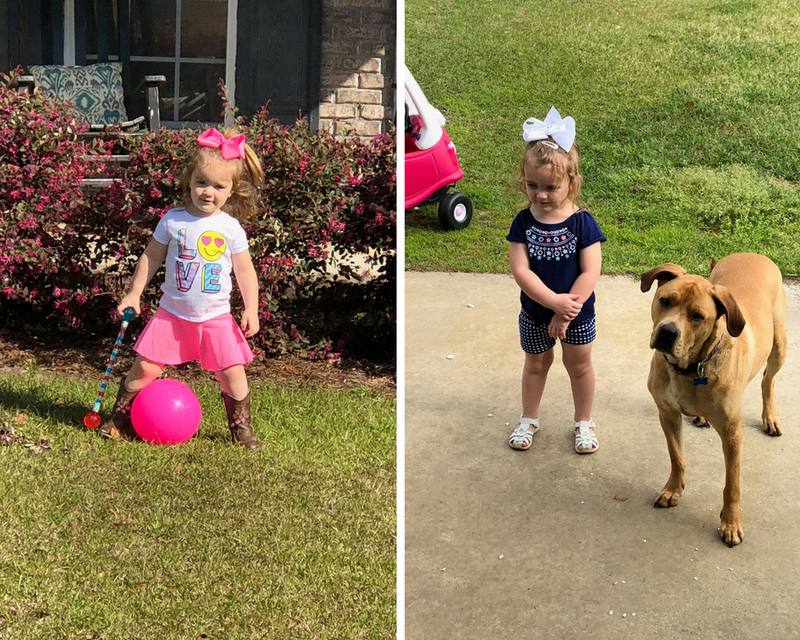 The blue skirt and heart shirt combo in the picture on the left is one of my favorite things to put her in, and the green tunic tank on the right comes in two other patterns. These lace shorts are so adorable, we have two pair! I've also been super impressed with Cat & Jack shoes, like these brown sandals (pictured above) and these purple hiking sandals. JCPenney is such a good store for affordable fashion for the whole family. For Alexis, I particularly like the Okie Dokie brand. The quality is up there with Cat & Jack, and so far I've had no issues with shrinkage. I couldn't find a link to the shirt Alexis is wearing, but we got this tie-dye flower dress at the same time. She's been wearing this monster tie-sleeve tee and polka dot skirt on repeat since the weather first warmed up. And I'm resisting the urge (barely) to order this cool cat dress. If there's one thing you can count on at Kohl's, it's a sale. Maybe it's just me, but every time I go there's some kind of sale going on. You don't need a sale to feel like you're getting a good deal on their Jumping Bean brand for kids. 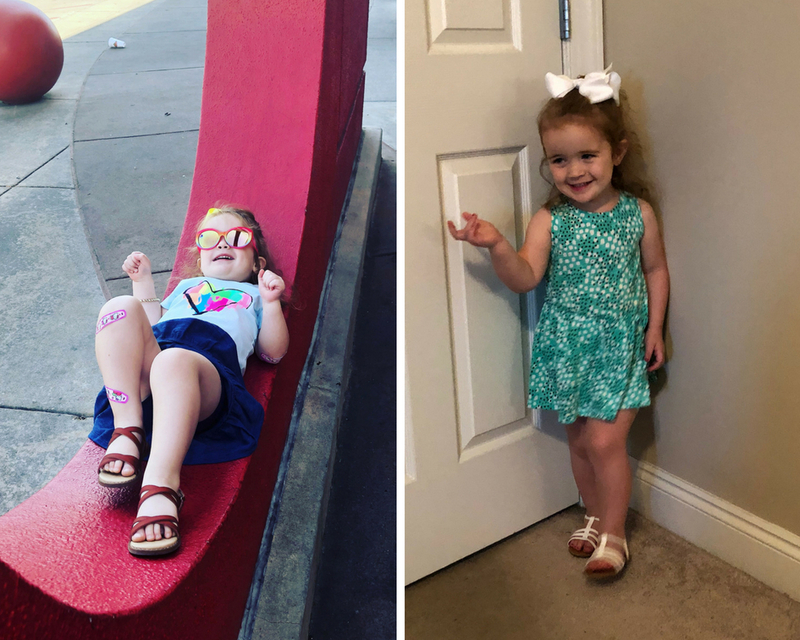 They have really cute mix-and-match shirts, skirts, leggings, shorts, and pants, not to mention adorable dresses like these, which may be my favorite type of dresses to buy for Alexis. Here's the link to the Minnie Mouse dress she's wearing in the picture. She also wears this Elena of Avalor dress all the time. We don't shop at the Children's Place as frequently as we used to, but they are a great place to stock up on t-shirts and jeans. They also have cute matching sets like these striped shorts and smiley face tank. I'm a fan of their dressier shirts, as well. Beware, their stuff runs small and shirts especially shrink. One of the other places I regularly shop for Alexis is Old Navy, but for some reason I have no pictures of her wearing anything from there. We stocked up on spring dresses (like this striped ladybug dress in pink and this green striped dress) right when they first came out, and this adorable star dress just came in the mail. I usually buy her normal size unless I want a little more length. I'm always on the hunt for cute, durable, and most importantly affordable brands for Alexis. Are there any places not on my list you'd recommend? Leave me a comment!